On view at the Los Angeles County Museum of Art is “Outliers and the American Vanguard,” an exhibition that laments forgotten voices in the last century. The term “outlier,” popularized by Malcolm Gladwell, commends strength in variance and deviation from the norm. It’s only appropriate that the term is reclaimed to embody a class of untrained, folk, and outsider artists. Described as an exhibition that demonstrates how trained and untrained artists converge, this comprehensive show instead serves a wider purpose to examine how “outsider” is a mentality rather than an academic classification. This exhibition examines three periods in the 20th century that gave rise to the diasporic voice of this country. The show begins by discussing how regionality played a large role in recognition. During the Great Depression, the New Deal created the Index of American Design which sought to provide work to designers and illustrators. This project documented designs that mostly fit into the Euro-American narrative, which was art primarily from the Southwest. In it’s fervor, it neglected to capture the work of artists from the South, omitting a large portion of African American artists. Here, we can see how very early on, geography played an influential role in forming the narrative of American art history. Furthermore, we see this division exacerbated in the midst of American Modernism, a period between the World Wars when art departed from institutions and academies to become more accessible to the public. The separation from Europe birthed a voice and culture that was distinctly American. At the same time, under the guidance of founding director, Alfred H. Barr, the Museum of Modern Art championed unschooled artists. He felt that the simplicity and unmediated nature of these artists were just as integral to the dialogue of modern art as the trained. However, its conservative trustees disagreed and dismissed him in 1943, preluding a similar dismissal that occurred last year (read: the Museum of Contemporary Art and Helen Molesworth). In this section, we see a narrative that isn’t usually brought to the forefront-- a painting that depicts an overturned boat of mariners in Dominique-Paul Peyronnet’s The Ferryman of the Moselle, as well as a young boy with European features stealing fruit on a table by Japanese-American artist, Yasuo Kuniyoshi. Who knows how expansive the selection of artwork in this gallery would have been if Barr had a longer reign. Following this period is post-1960s, a time dedicated to “civil rights, gay liberation, feminist, and countercultural movements.” This gave rise to the Chicago Imagists, a collective of experimental artists bred from the Art Institute of Chicago, as well as a fleet of self-taught artists that were considered “outside” the channels of conventional art. “Outsider” artists demonstrated a freedom unrestrained from the politics of art institutions. The lines of both groups begin to converge as “outsider” shifted to characterize an attitude and mentality. By rejecting the prevailing Abstract Expressionist movement at this time, artists in this countercultural movement returned to the human form, transfiguring the body to portray an extension of the self. Tension over the debate between untrained and trained artists developed as people condemned self-taught artists as incommensurable to their counterpart. 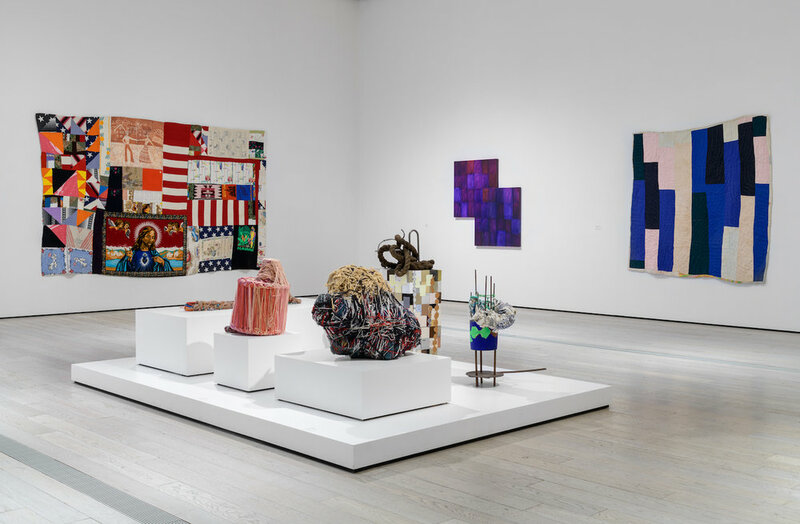 In this section of the exhibition, both groups are presented side-by-side to consider their relationship-- many critics arguing the institutionally-trained were inspired by the inhibition of the self-taught. Howard Finster’s unschooled aesthetic is characterized by his evangelical background, supernatural landscapes, and excessive handwritten text spilling over the paper. It’s incomparable to academically-trained Jacob Lawrence’s Sidewalk Drawings, which depicts two girls drawing on the pavement surrounded by chalk drawings of world combat-- a literal take on the exploitation of children’s artwork at this time because of its candor. By contrast, untrained artist Patrick J. Sullivan, who produced only nineteen known works, depicts two beings in a cosmic landscape looking out into the infinite universe in The Fourth Dimension. While each work is unlike the next, to disparage the work of the unschooled by describing it as incommensurable to the academically-trained seems oddly placed as each artist drew from their own personal experience. The last period in this exhibition discusses outsider artists and their place in the conversation of contemporary art. Here we see the gauntish yet glamorous dolls of schooled Greer Lankton, who was described as blurring the lines between folk art and fine art. Lankton, who underwent gender reassignment surgery, created dolls that examined the fragility of the human body. Rosie Lee Thompson’s elaborate gridlike quilts that weave motif and themes were inspired from her childhood helping her mother sew. Matt Mullican’s bedsheet drawings hang from the ceiling-- pieces created under hypnosis by his subconscious, an identity he felt was its own distinct person. The breadth and range of artistic expression is so expansive that it feels trivial to confine it in a label such as “outsider.” The debate over whether the trained was influenced by the untrained seems misplaced. If “outsider” artists made work without regard to institutional attention, can you really make the claim that trained artists grew to adopt a more outsider mentality if it aligned with their own personal experience and the countercultural movement? This exhibition asks us what the conversation of modern art could’ve been had there been more representation-- perhaps a little more democratic, a little less European. These key moments in the last century pushed the expression of a different league of artists and creators. However, despite the insight this show offers, the idea seems a bit conflicting. Were these artists left out because they were untrained or because of other systemic social prejudices? This exhibition unpacks the many layers of the untrained “outsider” artist-- the freedom gained by lack of institutional acclaim, the pitfalls of obsolescence, and the struggle to recover these voices. We find that the difference between the famous and the anonymous is the lack of cultural inclusion.